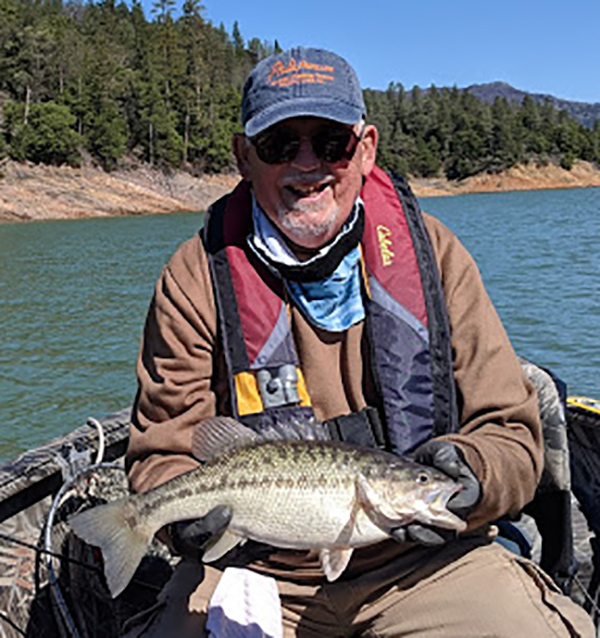 Many anglers had the same idea as quite a few boats were enjoying the beautiful weather on Lake Shasta this St. Patrick's Day Sunday. While most anglers were pounding the points in search of bass there were quite a few boats trolling in search of trout. Most trollers reporting a few fish but nothing outstanding. Many were trolling bat ray and optimizer spoon targeting about 15 to 20 feet depth, but our interest was in green fish in honor of the day. Frank Galusha, past publisher of Myoutdoorbuddy and myself joined those in search of bass choosing a late morning launch, knowing that the ramps would be crazy in the early hours with at least one bass tournament on the lake. Starting on the Mc Cloud arm we quickly boated a couple of nice spots in the pound and a half to two pound range. One fish coming on a hula grub and the other on a ned rig. Throughout the late morning and early afternoon we picked up a few fish here and there mostly off main points trying to leap frog tournament and other bass anglers targeting the same points. We moved out to the main body just east of the Mc Cloud arm suffering from the mid-day blahs and managed to pick up the action if not in numbers but in quality bass. I managed to land a couple of quality 3 pound spots on hula grubs. This had been my first bass outing of the year and to land a couple of threes was nice indeed as last year it seemed I had been stuck in the 12 to 15 inch class of fish routine. The lake is still slowly dropping as water controllers continue releases to make storage space for future runoff, sitting at just over 26 feet from full pool. Water surface temperatures were in the 50 to 51 degree range on the Mc Cloud while we found warmer surface temps up to 54.8 degrees on the main body. Water clarity is improving and debris was not an issue but boaters should always use caution. Most of the bites came in 20 to 30 feet of water with many of the ned rig bites very subtle. This should be a great spring for fishing on the lake especially for those who can fish during the week when the crowds and angler pressure is down.